Silk has set the standard in luxury fabrics for several millennia. Silk is highly valued because it possesses many excellent properties. Not only does it look lustrous and feel luxurious, but it is also lightweight, resilient, and extremely strong— the strongest natural fiber known to man, one filament of silk is stronger then a comparable filament of steel! Although fabric manufacturers have created less costly alternatives to silk, such as nylon and polyester, silk is still in a class by itself. The origins of silk date back to ancient China. Legend has it that a Chinese princess was sipping tea in her garden when a cocoon fell into her cup, and the hot tea loosened the long strand of silk. Ancient literature, however, attributes the popularization of silk to the Chinese Empress Si-Ling, to around 2600 B.C. Called the Goddess of the Silkworm, Si-Ling apparently raised silkworms and designed a loom for making silk fabrics. 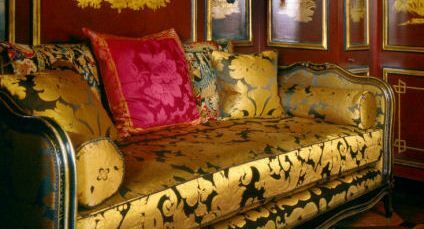 Silk was originally reserved exclusively for the use of the emperor; gradually silk came into more general use. Silk, indeed, rapidly became one of the principal elements of the Chinese economy. Silk was used for musical instruments, fishing-lines, bowstrings, bonds of all kinds, and even rag paper, the word’s first luxury paper. Eventually even the common people were able to wear garments of silk. During the Han Dynasty, silk ceased to be a mere industrial material and became an absolute value in itself. Farmers paid their taxes in grain and silk. Silk began to be used for paying civil servants and rewarding subjects for outstanding services. Values were calculated in lengths of silk as they had been calculated in pounds of gold. Before long it was to become a currency used in trade with foreign countries. For more than two thousand years the Chinese kept the secret of silk altogether to themselves. It was the most zealously guarded secret in history. Indeed, the reigning powers decreed death by torture to anyone who divulged the secret of the silk-worm. Eventually, the mystery of the silk-making process was smuggled into neighboring regions, reaching Japan about A.D. 300 and India around A.D. 400. 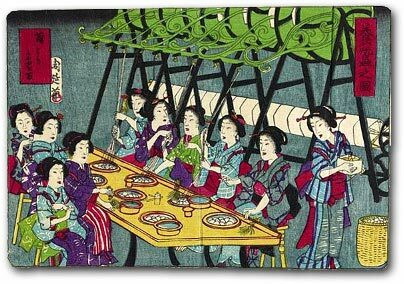 The first country to apply scientific techniques to raising silkworms was Japan, which produces some of the world’s finest silk fabrics. Other countries that also produce quality silks are China, Italy, India, Spain, and France. China was the largest exporter of raw silk in the early 1990s, accounting for about 85% of the world’s raw silk, worth about $800 million. Exports of China’s finished silk products were about half of the world’s total at about $3 billion. The finest, most desirable silk comes from the mulberry silkworm, which is actually a caterpillar and not a worm. Blind and flightless, it feeds solely on the leaves of mulberry trees. Known as the Bombyx mori, the mulberry silk worm is a fascinating but tragic bundle of insect life. Raised by professional keepers in China on trays of mulberry leaves a thousand years before the Roman Empire when wild tribes were roaming Europe living in stick and mud huts, the mulberry silkworm has been totally domesticated and can not live without humans for their care and feeding. There are no wild silkworms or Bombyx mori moths that roam and feed in the wild. The cultivation of silkworms for the purpose of producing silk is called sericulture. Over the centuries, sericulture has been developed and refined to a precise science. 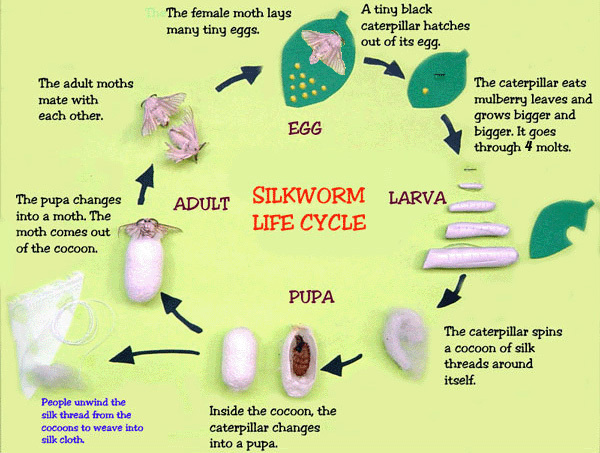 Today, a hugely developed industry has developed around the raising of silkworms for the production of silk. Silk worms are raised by large corporate silk worm farmers and hobbyists all over the world. 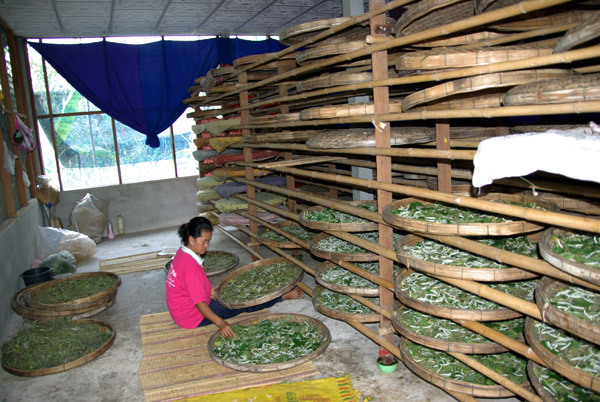 Sericulture companies sell and ship all that the silk grower enthusiast needs from Bombyx mori ova (silkworm eggs) in an incubation dish to handling tools. One acre of mulberry trees produces enough foliage to feed silkworms that create 178 pounds of cocoons which can be unraveled into 35 pounds of raw silk. The mulberry leaves are a renewable and sustainable crop as the trees produce year after year. One mature mulberry tree will produce enough foliage for 100 silkworms. Generally, one cocoon produces between 1,000 and 2,000 feet of silk filament, made essentially of two elements: a substance, called fibroin, makes up between 75 and 90% of the filament, and sericin, the gum secreted by the caterpillar to glue the fiber into a cocoon, comprises about 10-25%. Other elements include fats, salts, and wax. One silkworm produces very little useable silk. To make one yard of silk material, about 3,000 cocoons are used. The natural course in the cycle of worm to moth would be for the chrysalis to break through the protective cocoon and emerge as a moth. But by breaking its way out, it cuts this fiber off in many places, thus largely decreasing its value; So, sericulturists must destroy the chrysalis so that it does not break the silk filament. This is done by stoving, or stifling, the chrysalis with heat. The usual method is that of immersing the cocoons in steam for a few minutes. Another method, that of placing the cocoons in boiling water, serves a double purpose. Not only does it kill the chrysalides, but it also softens the seracin, the “gum” that sticks the threads together, so that they can be unreeled from the cocoon. Although silk is about 20% seracin, only about 1% is removed at this point. Reeling may be achieved manually or automatically. The cocoon is brushed to locate the end of the fiber. The method is as simple as it is laborious. It is threaded through a porcelain eyelet, and the fiber is reeled onto a wheel. Meanwhile, diligent operators check for flaws in the filaments as they are being reeled. As each filament is nearly finished being reeled, a new fiber is twisted onto it, thereby forming one long, continuous thread. Sericin contributes to the adhesion of the fibers to each other. s. The average cocoon reels off about three hundred yards in a single thread. This is raw silk, just pure silk fibers without any chemicals or treatments added, although sometimes the raw silk fibers will be soaked in a 1% hydrogen peroxide solution for a few hours to refine the creamy color. Organic and sustainable certification organizations are working on standards for organic silk but they have not yet been finalized and adopted. The remaining sericin, or silk “gum”, must be removed from the yarn by soaking it in warm soapy water. This is called degumming, and it improves the sheen, color, hand and texture of the silk. Because the gum can serve as a protective layer, it is usually left on the silk until it’s ready to dye. But the degumming process, which enables the silk to accept dyes readily and which contributes to its high gloss, also causes the silk to lose about 25% of its weight and not a little strength. If the scouring and bleaching are not well and carefully done, the reduction in strength may be serious indeed. After degumming, the silk yarn is a creamy white color. It may next be dyed as yarn, or after the yarn has been woven into fabric. After dyeing, the skeins are again dried, run through an equalizing machine similar to a stretcher, and then rewound into the form in which they are wanted by consumers and the trade, such as spools, bobbins, skeins, etc. This completes the process of silk throwing. The silk is now ready for the weaver, the knitter, the lace maker, or the embroidery maker. After the raw silk has been reeled into skeins or hanks, the most laborious parts of silk production are completed; that is, most of the work done on the fiber thereafter is done by machine processes instead of by hand. The amount of hand labor that it takes to produce raw silk is almost incredible, and the amount of labor taken after the machine processes begin is no less than for other textiles. It has been said that it takes more human labor to produce a lady’s silk dress, from the mulberry leaves into the finished product ready for wear, than it takes to produce and build a locomotive out of the raw ores in the ground. More hours are expended, and more people have something to do with the work. If the laborers employed in the production of silk were paid as high wages as are commonly paid in the iron and steel industry the silk dress would cost almost as much as that locomotive. As it is, raw silk production is carried on chiefly in countries where wages are very low. At the present prices of silk, the most efficient workmen doing their very best could not earn more than fifteen cents per day at this kind of work. Silk is sold by weight. “Weighting” is a textile manufacturing practice peculiar to silk manufacturing and involves the application of metallic salts to add body, luster and physical weight to silk fabric. The reason for adding metals to silk fabric is to increase the weight of the fabric and, because silk fabric sells by the pound, the extra weight increases the selling price of the fabric. Generally, only the finer and more expensive reeled silks are weighted rather than the less costly spun silks By means of weighting the manufacturer can increase the weight of silk by 3 to 4 times. Weighting is done by immersing the silk in a solution rich in tannin, then transferred to iron or tin baths, then washed. Weighting causes the fabric to lose its strength as soon as the weighting is applied. Heavily weighted silk must be made into garments as soon as it is made. Spots develop in the dyes. Saltwater, perspiration and tears cause spots to be formed which seems as if the silk is eaten by acids. Sunlight also attacks weighted silk and can cause silk to fall to pieces. The silk industry makes a distinction between pure-dye silk and weighted silk. In the pure-dye process, the silk is colored with dye, and may be finished with water-soluble substances such as starch, glue, sugar, or gelatin. But it is not weighted. If weighting is not executed properly, it can decrease the longevity of the fabric by causing it to lose much of its strength and durability, so pure-dye silk is considered the superior product. Also, the metallic salts used to weight silk can cause health risks and problems for some people. After dyeing, silk fabric may be finished by additional processes, such as bleaching, embossing, steaming, or stiffening. The wild silks are gathered principally in Japan, China; and India. There are several varieties of wild silk cocoons, each with qualities somewhat different from the rest. The principal variety of Japan is the Yamai-mai, and the chief varieties of India are the tusser, or tussah, and the ailanthus. Most of these silks are much darker in color than the domesticated silk, the Bombyx mori, probably because of the difference in feed. Wild silkworms do not always have mulberry leaves to eat. Great numbers feed on oak leaves and in some cases on other plants. In general, it may be said that wild silks are in most respects of poorer quality than domesticated silk. They are harder to bleach, and do not take dyes so well. They are generally very uneven in texture, but when made up into fabrics are often more durable than common silks. Wild silks are used principally in the manufacture of pile fabrics such as velvet, plush, and imitation sealskin, and in heavy or rough cloths such as pongees and shantungs. While the silkworms of the wild varieties take care of themselves, and therefore do not require the constant labor that must be given to domesticated silk, the expense of gathering is nevertheless high. The wild cocoons must be hunted, trees must be climbed to gather them, and much time may be consumed in collecting comparatively few. On the whole, however, because of the poorer qualities, wild silks are worth considerably less than “tame” silks. Silk, a protein fiber like wool, with a smooth hand, is very lustrous and retains its shape well. Silk can take on many different appearances. A raw silk fabric may fool you into thinking that it is cotton or synthetic. The more refined the silk and the smaller the yarn, the more it resembles the look and feel that we know as silky. Silk is the strongest natural fiber and is very strong in terms of tensile strength, meaning it can withstand a lot of pulling type pressure without breaking. This should not, however, be confused with wear ability or abrasion resistance. Silk will not stand up to the heavy wear that other fibers will. Because of it’s good absorbency, fabrics made from silk are comfortable in summer and warm in winter. Chemical treatments are also added to silk to improve anti-static, water and oil repellency, flame retardant, dimensional stability and other wash-and-wear properties that our easy-care culture seems to expect. Textile chemicals have become an integral and important component of conventional textile and clothing manufacturing. Textile chemicals, also know as textile auxiliaries, have two primary purposes: to increase the efficiency and lower the costs of conventional textile manufacturing; and to create special finishing effects and properties for the clothing. Silk fabrics have poor resistance to sunlight and UV exposure and must be protected from the sun. Draperies should be lined and even interlining may be desirable. Colors can fade by oxidation, called “gas fading”, if unaired in storage for a period of time. Impurities in the air may cause as much fading as the direct rays of the sun. Avoid storing silk fabric in a basement or attic near a furnace. Furnaces not only give off fumes but also pull fumes and impurities from other parts of the home. Silk will become brittle with age and exposure to sunlight. The silk fibroin from the silkworm is an ideal biomaterial (biocompatibility, biodegradation, non-toxicity, absorption properties, etc.) and has been widely used for sutures and other medical applications.